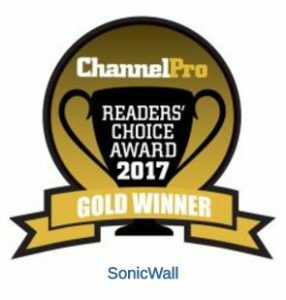 SonicWall is awarded Reader’s Choice 2017 Award Gold Medal in the Security Hardware category by The ChannelPro Network. The ChannelPro Network readers voted for SonicWall and are excited with the advancements SonicWall has made since it’s return to independence after being part of Dell. With SonicWall you can get the network security, control and visibility your business needs to innovate and grow faster. Leaf’s partnership with SonicWall allows us to deliver firewall security solutions to organisations of all sizes. Next generation firewalls deliver a much deeper level of security across wired and wireless networks, without compromising network performance. Designed with a scalable, multi-core hardware architecture and a patented, single-pass, low latency Reassembly-Free Deep Packet inspection engine, these high performance security appliances efficiently scan all traffic regardless of port or protocol. In addition to advanced SSL decryption and IPS capabilities, SonicWall firewalls also have access to a continually updated cloud database that contains tens of millions of malware variants. In addition they are easy to manage and deliver a low total cost of ownership. Our security experts will assess your current network structure to advise and deliver the solution that meets your unique security requirements. Get in touch with us today to arrange a security assessment or to discuss our security solutions.